This set includes a six strand pearl necklace and a pair of matching earrings. 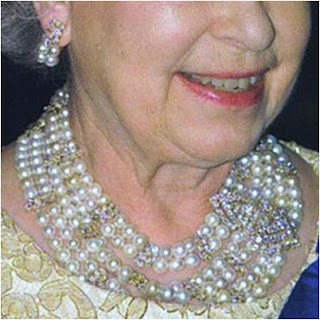 The necklace has small diamond plaques, each including six marquise diamonds and one round diamond, spanning two strands of pearls, and one large off-center plaque spanning all six strands. The earrings each have a group of diamonds on top of a group of pearls. 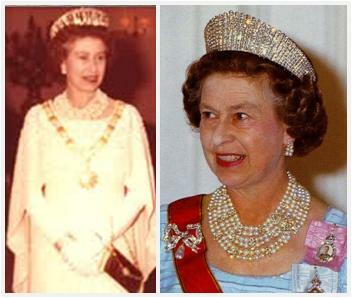 The demi-parure was a gift to the Queen from Sheikh Khalifa bin Hamad Al Thani, the Emir of Qatar, during her 1979 visit to the country and she wore it during the trip (above, left). The trip was a tour of the Gulf states and these pieces are just some of the jewels she picked up; others featured previously include the King Khalid Diamond Necklace and the Dubai Looped Sapphire Demi-Parure. We've also previously featured the Ruby and Diamond Swag Demi-Parure, another jewel in the Queen's collection with a Qatar connection. As for the Qatar Pearl and Diamond Demi-Parure, it has been worn outside of Qatar visits, but sightings are still pretty rare (that necklace is a statement piece to be sure, perhaps not the easiest to wear).